Faulty postures are considered as one of the most important causes leading to neck pain. Faulty postures may lead to stress and strain to various soft tissues in the cervical and shoulder regions in addition to the cervical spine itself. 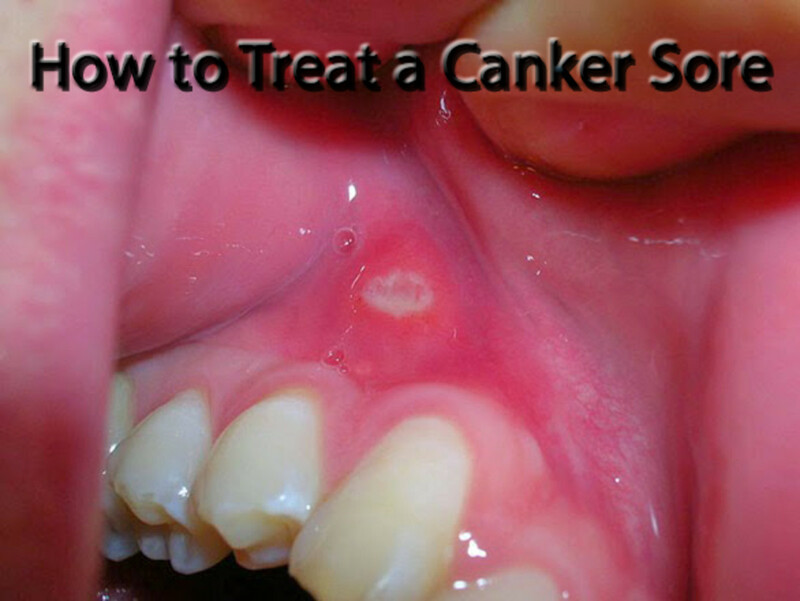 But usually this factor is frequently neglected while treating a neck injury. For preventing the possibility of recurrence or persistence of symptoms a thorough and well evaluated postural training and correction is essential. Chronic Cervical Spondylosis or Degenerated Cervical Disc problem may lead to ‘Forward- Head Posture’.Hence while treating cervical problems due attention must be given for postural corrections also. Postural corrective exercises must be prescribed to the patient after an extensive evaluation. Antero–posteriorly the Centre of Gravity descends from the occiput through the sacrum.Laterally the Centre of Gravity passes through the Cervical Vertebrae, through the shoulder of the dangling arm, posterior to the hip joint, anterior to the centre of the knee joint and slightly anterior to the ankle lateral malleoli. But in the case of ‘Forward- Head Posture’ the head is held ahead of the Centre of Gravity which causes an increase in Cervical Lordosisand a closing of the Posterior Foramina, thus entrapping the nerve roots. In the case of ‘Forward- Head Posture’ there may be bodily changes (both in the soft tissues and bones) causing pain, impairment and discomfort to the patient. The shoulders droop in and the scapulae rotate downward, the breast sag, the volume and the mobility of the thoracic cavity is diminished with resultant decrease in vital capacity and the person is literally shorter in height. 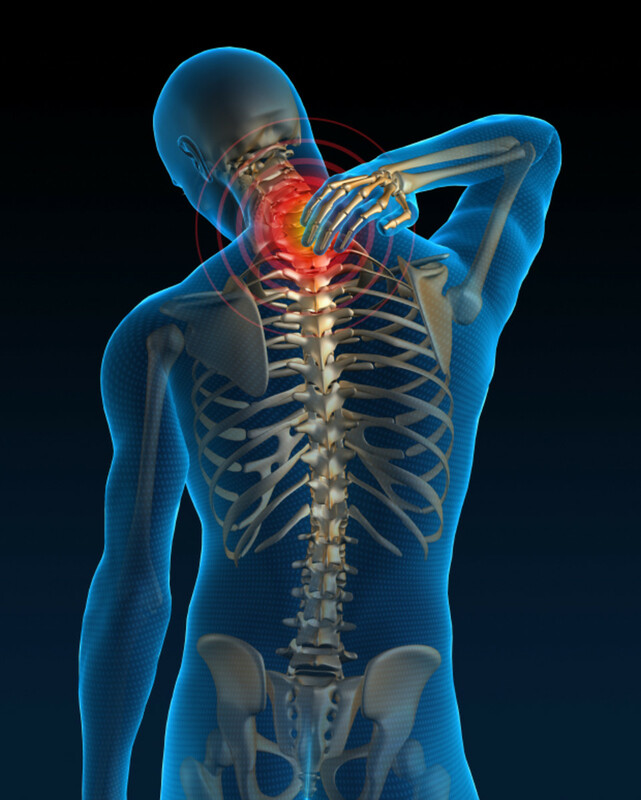 The drooping of shoulders adversely influences the cervical spine. As the upper trapezius muscle originates from the cervical spine, the drooping of the shoulders and the depression of the scapulae causes muscular pain, strain and tenderness on the neck and the trapezius muscle. Antero-posteriorly the Centre of Gravity descends from the occiput through the sacrum.Laterally the Centre of Gravity passes through the Cervical Vertebrae, through the shoulder of the dangling arm, posterior to the hip joint, anterior to the centre of the knee joint and slightly anterior to the ankle lateral malleoli. 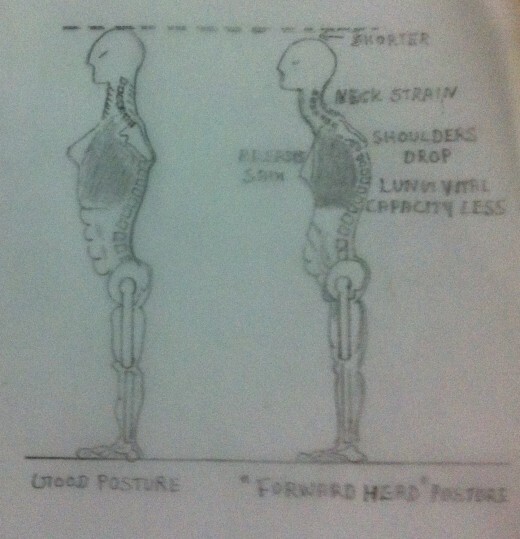 But in the case of ‘Forward- Head Posture’ the head is held ahead of the Centre of Gravity which causes an increase in Cervical Lordosisand a closing of the Posterior Foramina, thus entrapping the nerve roots. A conscious effort by the patient is essential for correcting the posture. 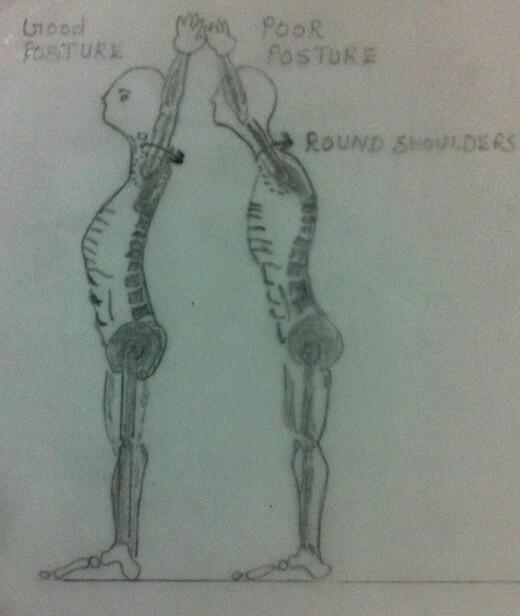 The postural corrective exercises must be practised regularly. The patient must be made aware of the concept of good posture and may be advised to attain the good posture by continuous effort. Activities of daily living must be evaluated and modified to avoid anything that can aggravate the patient’s cervical condition or that may prevent healing after an acute injury. 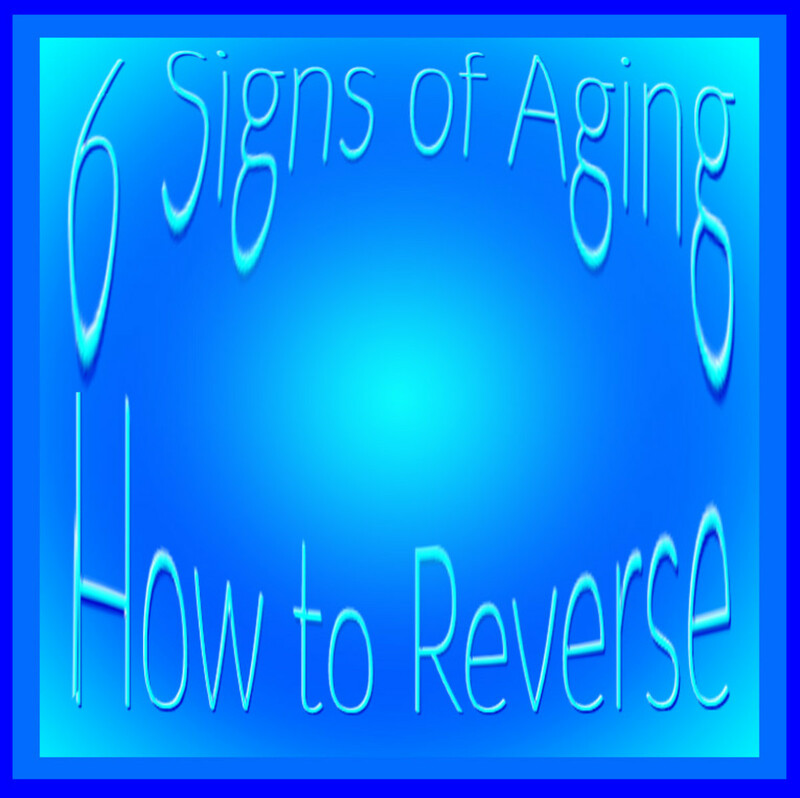 There are many activities of daily living that may be properly addressed to. 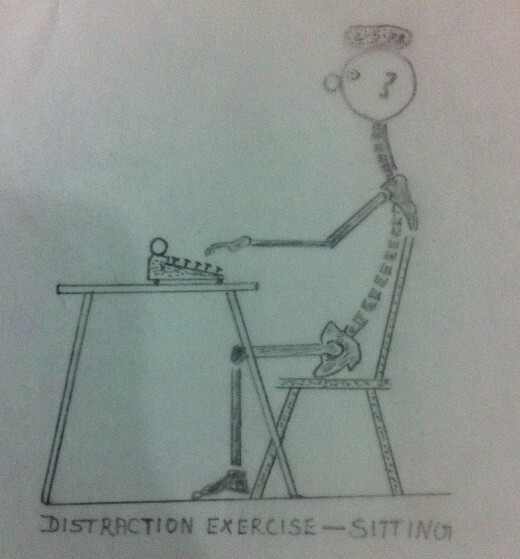 The daily activities that are frequently performed in an improper way are sitting, standing, lying, driving etc. The postural exercises help to improve the posture, the range of motion, flexibility and strength of the soft tissues of the neck, shoulders and shoulder girdles. 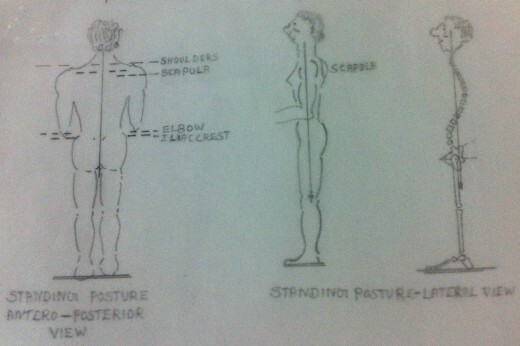 These exercises help the patient to learn the feel of proper posture. He can also experience the ease and the mechanical advantage with which he can carry out the activities of daily living which were once hazardous. These exercises can be done frequently at regular intervals. These exercises do not require any change of dress, no loss of work and no perspiration. One can carry out in between his work. It indicates a feeling of relaxation. The patient sits in a chair with the arms resting on the arm rest and the feet flat on the floor. He must be relaxed. The head is held in a neutral horizontal position with the chin not lifted up or lowered. Now the head is tilted horizontally forward with the chin held as in the starting position. Hold the head in the newly attained position for 3 seconds. Now slowly and gently bring back the head to the starting position. Take rest for one second. 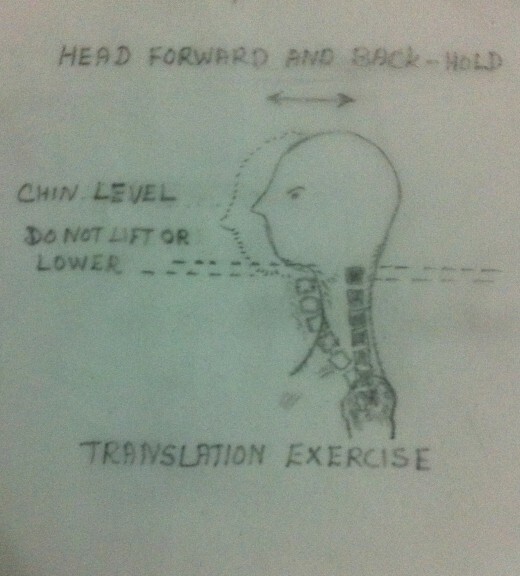 Now tilt the head horizontally backward with the chin held as in the starting position. Hold the head in the newly attained position for 3 seconds. Now slowly and gently bring back the head to the starting position. Repeat the exercise 5 times twice a day. This exercise can also be done in between while at work. This induces a feeling of confidence and relaxation because it provides the feeling of proper posture. This exercise increases the range of motion of the neck, decreases cervical lordosis and the ‘Forward –Head Posture’. The patient lies supine with the face upwards on a hard bed with the head facing the wall (not touching the wall). The patient must be relaxed. Slowly and gently press the head downwards and try to straighten the lordotic curve of the neck. While doing this exercise the head must be held in the neutral position with the chin not touching the chest, throughout the exercise. Now the patient will have the feeling that the neck gets elongated and stretched in the longitudinal direction towards the wall. Avoid bouncing movements. While doing this exercise one must be well aware and conscious of the position of the head, neck and the chin throughout the exercise. Now hold the head and neck in the maximum stretched position for 3 seconds. Now relax and bring back the head and neck to the original starting position. Repeat the exercise 5 times twice a day. The patient stands close to the wall with his back on the wall. The shoulder blades are close to the wall and the feet 5-6 inches away from the wall. With an increased cervical lordosis 3 or more fingers can be placed between the neck and the wall. The back of the head is pressed to the wall and the neck is gradually ‘forced’ to the wall till the gap between the neck and the wall is about two fingers width. At this stage the cervical lordosis is optimum. 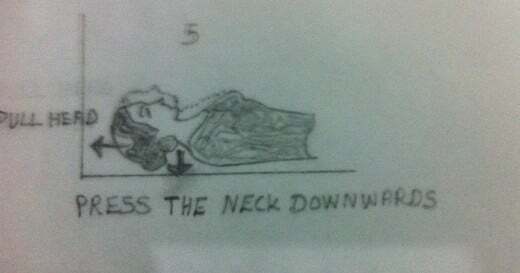 Forcing the neck downwards with the chin tucked in gives the patient the feeling of pushing the head towards the ceiling. In short the patient gets the feeling of ‘standing taller’. While doing this exercise the low back may also be pressed to the wall. Thus this exercise decreases not only the cervical lordosis but also the lumbar lordosis. Hold the head and neck in the maximum stretched position for 5 seconds. Now slowly and gently return back to the starting position. Repeat this exercise 5 times twice a day. The patient stands close to the wall with the shoulder blades on to the wall and the feet 5-6 inches away from the wall. The back of the neck is pressed to the wall and the neck is gradually ‘forced’ to the wall. Place a weight (2-5kg) upon the head and try to push the weight towards the ceiling. 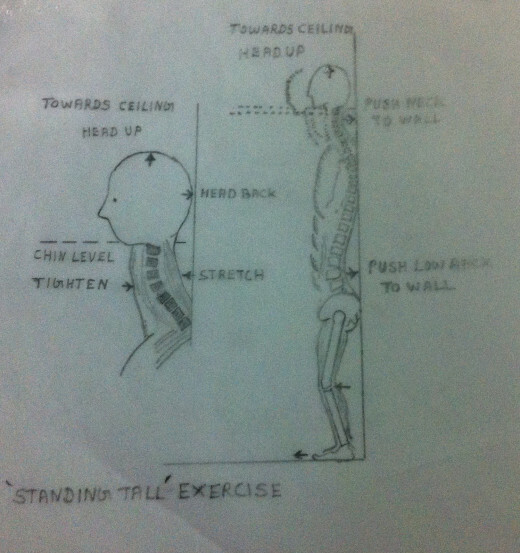 This exercise decreases the cervical lordosis and hence the patient gets a feeling of ‘being taller’. The attempt to push the weight towards the ceiling is continued till the gap between the neck and the wall gets reduced to one or two finger width. Hold the head and the neck in the maximum stretched position for 5 seconds and then return back to the starting position. Do the exercise 5 times twice a day. While doing this exercise the low back can also be pressed against the wall. 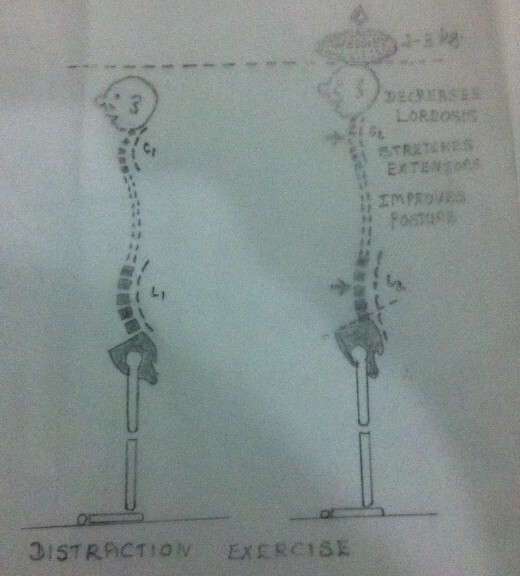 Hence this exercise helps in the reduction of cervical as well as lumbar lordotic curves. This exercise can be done while one is carrying out his activities of daily living. It also provides a feeling of correct posture to the patient. 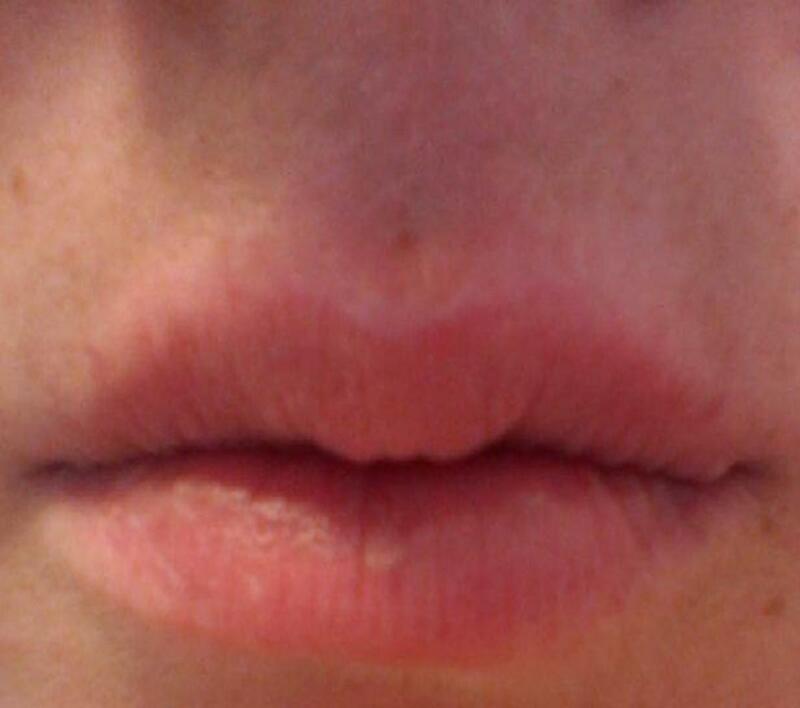 Think of a patient who is sitting on a chair and working on a computer. Place a weight (2-5kg) upon the head and try to push the weight towards the ceiling. While doing this the neck get stretched and straightened and the lordotic curve of the neck decreases. This way the patient can maintain an almost erect posture wherein the cervical lordosis is minimal. Hold the head and neck in this stretched position for 3 seconds and then come back to the starting position. This exercise can be done, at any time, while doing work at intervals. This exercise helps the patient to learn and understand the proprioceptive concept of erect posture with no effort.As a part of treatment regime, this exercise can be done 5 times twice a day.